If there is a bellwether for the wider global economy it is that of Singapore that has spent a lot of the past 2 years growing well. However, storm clouds are gathering around both the global economy and Singapore’s. Some fears affect both – a slowing of the Chinese economy, interest rates rising and trade friction increasing – while some are more relevant to Singapore itself such as a slowing of the tech sector. As such, alongside the belief that inflation in Singapore should start to slow throughout 2019, we enter the year in a negative mood on the Singaporean currency. Indeed, at the moment markets expect the Monetary Authority of Singapore to tighten monetary policy in April – the next policy meeting – and following a poor Q1, we expect the MAS to be forced to hold off and the Singaporean dollar to weaken as a result. 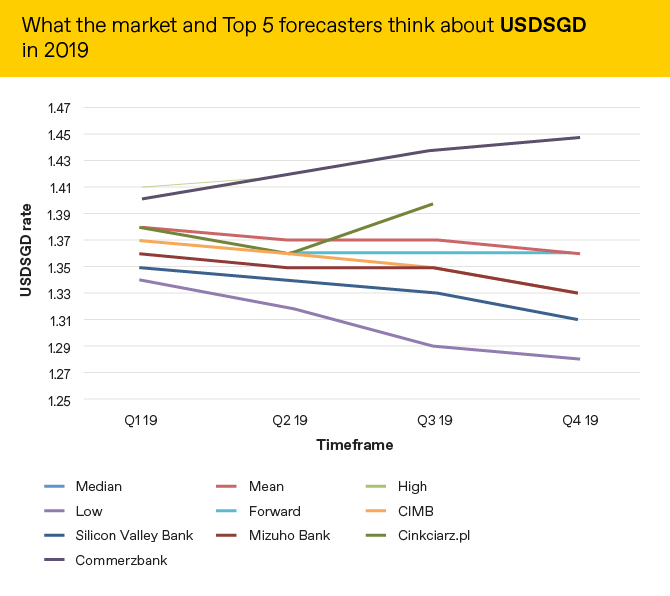 Market expectations of what will happen to the SGD versus the USD are below alongside the predictions of the 5 most accurate forecasters as measured by Bloomberg.